Profiles of Technology - VR, AR, SaaS, API - oh my! When we think about technology in the context of the 21st century, mobility and fast connections are where it’s at. There’s an app for everything, information moves quickly, and worlds are connected at the touch of a button. 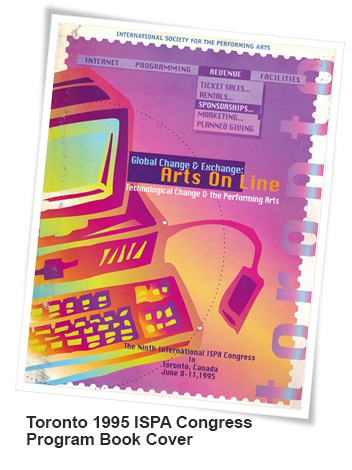 But not so long ago, the internet was just starting to shape how artists and arts organizations created and presented work (see program book cover from 1995 Toronto Congress - love the font!). Though the font may be dated, being connected online is still as vital today as it was in the 90s. ISPA has tapped into the mobile reality with the Congress and Members Only app. The congress apps are designed to keep delegates connected – you can search by name or country and use the chat feature or email a delegate right from the app. The congress app also provides quick reference information for the schedule including speaker bios, session descriptions, and maps. The Members Only app was designed to be an on-the-ground connector for ISPA members attending industry meetings, festivals, marketplaces, and conferences around the world. For anyone attending the upcoming Edinburgh Fringe Festival, the ISPA app is a great way to identify other ISPA members in attendance and offers quick chat or email features for getting in touch with them. To learn more about using the ISPA Members Only app, check out these quick how-to videos. Though apps are a great way to use technology, they are by no means the beginning or end of the story in our industry. We asked three members to tell us how they are using technology to address the needs of clients, artists, and audiences in their respective businesses. How are you using technology? Leave your stories in the comments below. 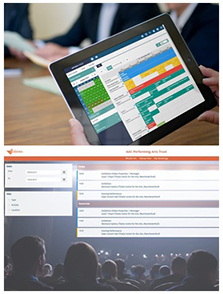 Performing arts organizations around the globe manage their venues and events with Artifax applications. Our clients include the Royal Albert Hall in London, the Grieghallen in Norway and the Toronto International Film Festival. We released our first cloud application back in 2004, before Google brought the phrase “cloud computing” to the masses. Today, driven by the proliferation of digital devices allowing users to access their data on demand, renting software as a service (SaaS) has outstripped buying desktop products. The focus of our software development has shifted as a result: freed from the constraints of installing our applications, we’re ensuring hyper-connectivity of people, devices and personalized content. Our flagship application, ArtifaxEvent, has a new companion product, ArtifaxAgora, addressing the demand from our clients for their customers, prospects, suppliers, staff, volunteers, performers, artistic collaborators et al to “self-serve”, accessing only the ArtifaxEvent data relevant to them. ArtifaxAgora uses our public Application Programming Interface (API), which is also key to clients leveraging access to the Internet for foyer screens, room signage, air con systems, box office and audience apps. Our most-requested feature, reports automation, allows users to receive curated information from ArtifaxEvent delivered straight to their inboxes when it suits them. We’ve been doing a lot of work under the hood with the audit trail to facilitate triggers (akin to IFTTT) too. Last, but not least, security is now squarely in our remit: much of our engineers’ time is spent making it easier for our clients to access their data than ever before, whilst keeping those with nefarious intent at bay. Arup Experience Labs combine Virtual Reality (VR), Augmented Reality (AR) and 3D spatial audio to create a unique, shared immersive experiences. Arup m|Lab is mobile and takes experiences directly to a project or client site. It can be used to demonstrate how a new or refurbished arts space (concert hall, opera house, theatre, or other spaces) will sound and look before it is built. It is also being used to create new art works. Experience Labs bring value to clients at every step of the pre-design and design process. Demonstrating design iterations for a project, giving clients and users a chance to make informed decisions based on direct subjective experience. It provides design confidence, protects critical parts of design from value engineering, speeds up the design process, and is a platform for consensus building. It offers an excellent opportunity for open communication and public outreach. It also can be used for donor engagement and fundraising, particularly helpful in attracting technology donors to projects. Visualization and auralization greatly improve the ease of spatial coordination with design teams and gives clients a sense of the character, intimacy, and scale compared to existing venues. It also allows one to experience sightlines and “soundlines” from various viewpoints which is difficult to convey with conventional drawing methods. This is fundamentally transforming the relationship between designers, clients, users, and audiences. The tools we use are also being deployed by artists in a vast range of projects in every arts medium, which in turn is driving the technology to new places. We have been working closely with artists creating works in music, opera, and theatre utilizing these technologies. The new creative opportunities will continue to generate new technology native audiences to the arts in the coming years. The University of Guadalajara (UdG), an innovative and visionary organization, supports the arts and culture in the region and in Mexico by building world-class infrastructure for the region (Diana Theatre, Auditorio Telmex, and the new Performing Arts Complex of Guadalajara) and designs the architecture of public policies that best address artists’ and creators’ needs, resulting in international recognition and development. As the world changes and transforms, our endeavor in arts management has to evolve and transform to address industry needs. Cultura UDG has tackled this challenge with different digital platforms. These platforms such as The International Music Fair (FIMPRO) and Escenia meet the needs of the sector by facilitating and supporting arts production and arts consumption. In a nutshell the platforms are places where creators and industry professionals have virtual encounters with people who have similar interests within a creative industry. Escenia, for example, provides tools to craft budgets for projects that become instrumental to the provision of strategies on how to successfully plan the project. Also the platforms provide key information regarding grants, important events happening, and touring mechanisms within the industry. The information gathered allows UdG to analyze the trends of artists’ needs, which in turn helps us build criteria to identify potential components of a successful season, and helps us develop strategies to attract new audiences. The audience’s platforms help identify new possible audiences and create engagement with this new audience while encouraging engagement with our known audiences. Using a platform such as culturarewards.com we create algorithms that allow us to get to know our audiences better. This information is not always provided by the individuals, but mined from their consumption patterns and thus is derived from a form of revealed preference. We are also analyzing behavior and user experience within the platform: if they were checking out the new cinema program, did they buy a ticket? Did they buy tickets for another show? Individuals that purchase tickets to concerts, shows, and events through culturarewards.com get rewarded with different surprises such as free tickets, credit they can use to buy other shows, or cafeteria promotions, but also travel to theatre or music festivals in other parts of the world. Cultura UDG´s technological platforms and programs help create wealth for the cultural and creative sector of the region and we are stressing the importance of accurate and timely information guiding administration and planning in what is undoubtedly a crucial crossroad between artists’ creative input, their livelihoods and the management of our organization.